Captain Potts: Carry on Sergeant. 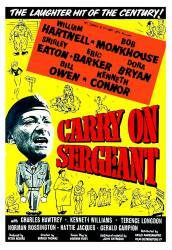 The first film in the "Carry On" series. It had not originally been planned as the start of a movie series, but after its success at the box-office, producer Peter Rogers and director Gerald Thomas set about a further project with "Carry On Nurse" (1959), which was enormously successful. The "Carry On" series of films evolved after that.